You are here: Home / Health / What Is Wrong With Black Men? My Answer. What Is Wrong With Black Men? My Answer. I care little if others consider my non-verbal response to be impolite; that is never my intention. I wish that they understood that I could never provide a succinct answer to this matter as it is a very complex answer that mandates more than an “off the cuff” answer. My understanding that this matter requires our full attention has led me to address this matter in this space. Before I embark on this ambitious journey, I already understand that I will fail at providing a complete answer. I am confident that reasonable people agree that this relatively small space is insufficient; put simply, this problem has not only existed but also morphed over the past 400 years. 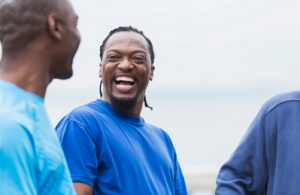 Consequently, the answer to why African-American men lag behind all others in nearly every socioeconomic and health indicator is difficult to fully answer in any space, let alone a blog entry. Those seeking to uplift black men must understand that the underlying catalyst to their collective suffering has morphed since the arrival of the first stolen Africans in the Jamestown colony in 1619. The historical record indicates that the existence of Africans in colonial America forced a cascade of decisions such as are these ebony men free, half-free, or slaves. The status of stolen African males was so tenuous that it was common for the British invaders of the North American continent to assert that this dark population was a sub-species of humanity. In the wake of chattel slavery’s disappearance, the familiar question of “From where do the current challenges facing black males emanate?” Of the most popular contemporary conclusions regarding black male suffering is that the catalyst is the destruction of the black family; particularly can be traced to the disintegration; most notably, the absence of black fathers as socializing agents in the lives of their children. Data reveals that in the late 19th Century, Philadelphia, “the city of Brother Love” had a thriving black community with 75% of the homes headed by two-parents; in 1925 nearly 80% of New York City’s black households were similarly structured. Such information is crucial to understanding the undeniable fact that the female headed-household is a relatively recent phenomenon in Black America. Census data conveys that before the 1954 Brown v. Board of Education decision only 18% of Black households were headed by a single parent. Most would be shocked to learn that during this period, the African-American marriage rate exceeded that of whites; this situation lasted for a full century after the U.S. Civil War ended. The above information serves as a significant stumbling block for those who cite chattel slavery as the catalyst for the destruction of the black family unit. According to noted scholar Walter Williams, in 1940, only 14% of black children were born to unwed mothers. When measured against contemporary rates, such data is best summed up by the Biggie Smalls lyric, “Damn, things done changed.” Today, the rate of children born to unwed mothers sits at an average of 75% (it is as high as 90% in many central city areas), nearly half of marriage-age African-Americans will never marry, and 70% of Black households are female-headed. Closely associated with these matters is the reality that Black female-headed households experience poverty at a rate of 47% versus the 8% rate found among married Black households. A study conducted by the Organization for Economic Cooperation and Development found that 25.8% of American children are raised by a single parent, a number high above the 14.9% average seen throughout the industrialized world. Among African-Americans, the rate is nearly five times the global average, with 72% of black children relying on a single parent, usually the mother. Most agree that the primary culprit in the destruction of the black family is none other than the pursuit of integration, a process that muted Black America’s traditional value system. Put simply; it appears that integration eroded Black America’s traditional principles of familial solidarity in favor of a European worldview that tends to use finances as the primary, if not the sole determinant of a mates worth. Such a worldview is the antithesis of the historical cooperative relationships and collectivist economics that has kept African-American couples afloat during the leanest of times. In the last half-century, it is obvious that the maligning and dismissal of black men by the women that they produce children with is reflective of this worldview. One must not forget that black women are not alone in adopting such dubious values, black men have also integrated significant portions of the “ain’t nothing going on but the rent” perspective into their value system. Such a perspective has proven disastrous to black fathers whose financial hardships frequently lead to their exit from their families under a cloud of shame. Amazingly, the scholarly community has even joined the choir questioning the utility of fathers in the home. A Johns Hopkins University sociology professor argued the following. It has yet to be shown that the absence of a father was directly responsible for any of the supposed deficiencies of broken home. (The real issue) is not the lack of male presence but the lack of male income. Despite voluminous protestations, many women have intentionally aided the proliferation of female-headed households through a host of questionable activities, poor decision-making, and flawed priorities. The actions of many women appear to be emanating from the foolishness shared in the John Hopkins study referenced above. Put simply, such women, not all black women, behave as if the black father’s only utility is providing financial resources. Failure to reach this threshold renders him disposable. The erasure of black males from the lives of their children creates cavernous gaps in their socialization. Daughters find it difficult to set ground rules and expectations for her dealings with suitors. Just as importantly, the father serves as the primary modeler of manhood structures for his son. The father’s absence from his children’s lives, a situation that should never be conflated with his absence from the home, usually ferments a dysfunction that is never corrected. Black women raise their daughters and love their sons. It is difficult to argue against Kunjufu’s assertion. Mother’s, the primary socializing agent in black girls understanding of ‘what a woman ought to be and ought to do’; however, even this process holds significant dangers if the mother lacks a clear understanding of womanhood. There is little doubt that the father’s absence from the lives of his son leaves his offspring lacking crucial manhood training. Despite the loud protestations of many women, their inability to “teach a boy to be a man” is not worth discussing. The evidence of such abounds. Despite childish tantrums from black women, they cannot teach black boys to be black men. Such foolish becomes painfully apparentwhen one attempts to argue that black men possess the capability to groom the next generation of black women without the input of black women. The assertion is ludicrous. The efforts of black women to usher black boys into manhood without the input of some black male tends to cripple black boys with ridiculous strategies remind one of a bi-polar mental disorder that vacillates between a mother’s doting love and a tyrannical overseer seeking to increase cotton production. Such unpredictable actions have innumerable repercussions that will manifest themselves in a host of ways during adulthood. Although rarely discussed, the father’s absence in his daughter’s life carries significant danger. According to scholars such as Jawanza Kunjufu, when fathers are absent from the rearing of daughters, girls grow up witnessing their mother carry an oppressive psychological load and untenable financial demands without any regular assistance from a male. Such concerns are compounded by the tendency of mother’s not to demand much from sons. When the time arrives for black girls to consider a mate, their ignorance of a fully functioning productive partnership marginalizes such efforts and compromises the future of Black America. When viewed from this perspective, it is predictable that black girls raised without the presence of a suitable male figure will most likely gravitate toward males who offer little of anything. Just as troubling, Black males raised without a father create a patchwork understanding of manhood from a junkyard of readily available life lessons and teachings in American streets. A cursory glance of the contemporary state of African-American males verifies the voluminous damage that flawed constructs and bad advice produce. If nothing else, the present state of black males proves that appropriate guidance from some male figure, preferably the father is essential to future success. So, the next time that the question of “What is wrong with Black Men?” is posed, I will answer in the following manner. I believe that many factors led to the contemporary marginalized state of Black men; however, it is at least partially attributable to the disintegration of the family and the haphazard manner in which many, not all, black women have destroyed their family and by extension lessened their children’s future by failing to value the contributions of a two-parent home. It is also attributable to black men who have never received or chose to not adhere to the rules of manhood. The alluded to black men have unfortunately perpetuated a dysfunctional cycle that combines with institutional racism, white bigotry, and discrimination to ensure the marginalization of black men for yet another generation. Unfortunately for Black America, the sins of the parents are visited on the children. In many ways, it appears to be a deep bruise that never heals and therefore dooms black children to live lives that mimic their parents. Although I would love to argue against the idea that my community, with the help of white bigots and racist institutions, has created an efficient cycle of familial destruction that will repeat itself until the end of time; however, I cannot bring myself to lie to you. One may also connect with this brother via Twitter; DrJamestJones. I can tell from your comments on this article and other articles on this site that you have issues. I suggest you get counseling. And while you may have picked bad guys, they are the men YOU PICKED. First I suggest you read my post, look at the color of your hands and realize your real color. Second you sound angry from personal experience but you can not define all African American men who the ones YOU chose. As a marriage, family and relationship counselor, life coach and mediator and a former detective who has easily handled over 100 cases of family conflict, i can say you need counseling. I wonder how your relationship is and how many you had. Women like you are a huge part of the problem. You do exactly what the slave master did then complain about the men you chose, wounded or helped to oppress. As far as those who have been arrested, reality is not based on your personal experiences. The facts and stats say things very different. And if you are not a part of the man’s solution or your child’s solution, you are a part of the problem. A parent is a parent for life. I could answer each one of your points but I am not going to spend all day answering rage for free. Get counseling and fast. YOU KENDRIA ARE AN ANGRY WOMAN and that might be why you have gotten what you did. I’d like to see a study on how many black men left their families to sell and do drugs, start families with white women, and just generally live a life with lots of pleasure and little responibility. Articles like this never ask what black men did and still do to make themselves useless to thier families and communities. IT’S ALWAYS THE FAULT OF WHITE MEN AND BLACK WOMEN, AS IF THE TWO GROUPS ARE ALL POWERFUL DEMI GODS. I always have felt like my family was a snap shot of the contrast between black men and women who belong to the baby boomer generation. My mother got a college degree in the 70’s. She worked to pay her way through college. She never married and adopted me as a single parent. She always expressed her frustration with the fact that black men who were educated in her era married white women and the black men who were uneducated made babies with women they never chose to marry. My aunt married and is still married to a man with no education. She went to trade school and always earned more than him. She never disrespected him despite the fact that my grandfather hated his guts and everything they have is because of her hardwork and sacrifice. They’ve been married 43 years. The truth is no one, especially a woman of child bearing age, should build a family with someone with way less ambition and drive to economically secure their offspring than them. My uncles all smoked crack or sold it, got involved in street life, and either abandoned thier families by leaving, being murdered or put in prison. My point is even with systematic racism, every black American has a choice to make and a responsibility to do the best they can with what they have. It’s always been my experience that most black men just simply make poor life decisons. I even see it now… I have a friend who is nine years my junior, 21 years old, and a felon. He grew up with both parents in the home and a stern father and loving mother, plus loving extended family. He chose gangs and stealing and selling drugs after high school instead of college, trade school, or the military. That was his choice, not his mother, not the prosecutor, or the officer who arrested him. His alone. And there are thousands and possibly millions of young black men just like him running around. I had a baby out of wedlock at 22, and I don’t nor have I ever put his father down. But I chose to get and education and stay employed so in ten years when my son is 18, he will have a college savings, and a good example of what it’s like to make sacrifices for your children. I’ll only be 40 when I send him off to school or to backpack abroad or study medicine in Cuba or work an internship in Silicon valley. I was raised by a single mother and so is he. I’m not devaluing the role of a father in a family, but my point is, black men were failing BEFORE black women decided they were a liability to their families and communities. My grandfather’s mother was born a slave and was also abandoned by her first husband. Despite my grandfather being born at the ABSOLOUTE WORST TIME TO BE A BLACK MALE IN AMERICA, he kept a job, took good care of his wife and eight children, put aside money for his granchildren, and lived to see his great grands. To hear black men who are barely 50 years old complain is so cringeworthy and disappointing. Yall sound so weak and conquered. The destruction of the “black” family is not largely because of integration. It is in part because of assimilation, slavery and lack of identity. Integration allows identity to remain consistent but assimilation reform that identity, in this case as done by others who seek to oppress a people and inaccurately. From the judicial system to corporate America to the news media, attacks,, oppression and institutional racism, prejudice and bias have been culprits also. Separation does not work because separate is never equal in America. You might want to rethink your point. We know clearly segregation does not work. Integration will work just fine for those with strong ties to family and spiritual identity. Assimilation will not. I suggest you read my article on this cite which points out Why Blacks Are Expendable. Further look at the color of your skin, the “color” of your car tires then ask why you call yourself and your people “black” when we clearly are not. It is brainwashing. FEEL FREE TO CONTACT ME. I deal in facts, not perceptions. You article is informative but the premise you start from is incorrect.